Freddy Krueger Announced as Mortal Kombat DLC, Sheds Light On Three Month Rumor. It's that time of year again. Over a hundred thousand fans of comic books, videogames and general geek culture are gathering in California for the annual San Diego Comic Con. While most of us won't be in attendance, we still get to soak up all the juicy bits of information that get revealed throughout the weekend. So far on the videogame front Ultimate Marvel vs. Capcom 3 was unveiled, Street Fighter X Tekken got Poison'd and Lego's getting a lot more super hero related sets (which I assume foreshadows a new slew of Lego videogames). Today also saw the reveal of the forth downloadable character for 2011's fighting game hit Mortal Kombat. While many fans online were expecting Tanya (the woman chained up in Shao Kahn's coliseum when Kitana is chosen) to be announced, it seemed that Ed Boon and the rest of NetherRealm Studios had a different agenda. Horror move icon Freddy Krueger will be available to download on August 9th via the Playstation Store and Xbox Live Marketplace for $4.99 or 400 Microsoft Moon Monies respectively. The Nightmare on Elm Street frontman appears to be just as violent as the rest of the MK cast in the trailer below (Courtesy of IGN). A brief trip around some internet forums show quite a few shocked Mortal Kombat players regarding this news. While I certainly raised an eyebrow, I wasn't necessarily all that surprised. You see, three months ago, website The Bigbag posted a rumor that horror movie icons Freddy and Jason were coming to Mortal Kombat as downloadable fighters. Though it made sense due to Warner Bros. being the parent company to NetherRealm Studios, and both Freddy and Jason housed under the Time Warner. brand, many people just tossed the rumor out as pure nonsense. Bitbag claimed that both characters would be released around Halloween, but it seems that Freddy came to the party a little early. While in no way does this confirm Jason's downloadable appearance, it appears that this is one of those cases where a (sort of) far-fetched rumor turned out to be true. 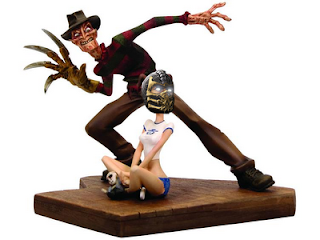 Freddy is the forth announced DLC character for Mortal Kombat and joins the already released Skarlett, Kenshi and Rain. Will you be downloading him in a few weeks, or are you just going to grab his compatibility pack for the free retro skins? Right now, I'm feeling the latter.